Because psoriasis is a chronic condition, there is no cure. However, you can take advantage of a number of treatments to reduce its uncomfortable symptoms and restore the health of your skin. At Beauty Thru Health Dermatology, P.C. in Oklahoma City we offer several forms of psoriasis treatment, including a therapeutic excimer laser, which can target specific areas of your skin for dramatic improvements. Dr. Clarence Wiley, Sr. has trained extensively in dermatological services for various skin tones and can recommend a therapy suited to your unique needs. Psoriasis is a chronic condition which typically goes through cycles of flare-ups. While there is currently no cure for psoriasis, lifestyle changes and dermatological treatments can allow you to manage your symptoms. Because the cells on the surface of your skin are growing too quickly in psoriasis, they create patches of inflamed or thickened scales. If you suspect you have psoriasis, it is a good idea to visit a doctor. When left untreated, psoriasis can cause enough pain and discomfort to interrupt your daily life. Severe psoriasis can even lead to joint problems. 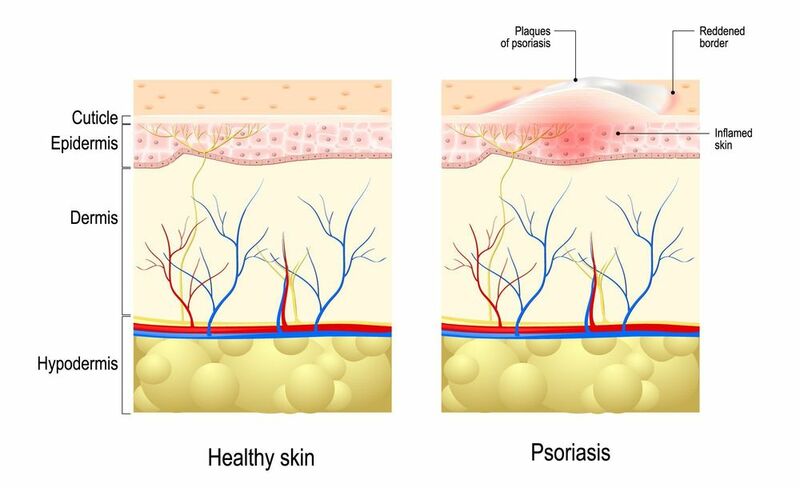 Dr. Wiley can examine your skin to evaluate whether or not the cause of your complaints is psoriasis. If so, he can also determine the type of psoriasis you have and the best way to treat it. There are three main treatment options available for psoriasis: topical treatments, light therapy, and oral medications. Topical treatments are commonly used for mild to moderate psoriasis and usually consist of topical corticosteroids or other ointments intended to reduce inflammation. In more severe cases, topical treatments are used in combination with more involved therapies. Dr. Wiley has trained extensively and learned to tailor the treatment to each patient’s unique needs and skin tone. Because psoriasis sometimes responds positively when exposed to controlled amounts of natural sunlight, phototherapy uses natural or artificial ultraviolet light to reduce symptoms. However, excessive light exposure can worsen your symptoms and cause skin damage, so this treatment must be applied carefully. At Beauty Thru Health Dermatology, we offer phototherapy using our advanced light technology and therapeutic laser system. Dr. Wiley can use specialized light and laser devices to precisely target the affected areas of your skin and control scaling and inflammation. There are several types of phototherapy which can reduce the symptoms of psoriasis. In some cases, we may recommend combining it with certain oral medications, as well. At our dermatology practice, we offer the highest level of care possible for patients made uncomfortable by the effects of psoriasis. Dr. Wiley has trained extensively and learned to tailor the treatment to each patient’s unique needs and skin tone. Learn more about our advanced treatment options by contacting our office online or calling (405) 278-7911 to speak to a member of our team today.